It’s certainly a weird feeling to be at the trade deadline and dealing players away rather than getting them back, but today the Dodgers dealt Rafael Furcal to the Cardinals for minor league outfielder Alex Castellanos. To say that Raffy will be missed is truly an understatement. Though he spent much of his time at the Dodgers battling injuries, you’d be hard pressed to find a more caring individual during his six years in Los Angeles. He is beloved by his teammates and everyone around the game because of what he does on the field, but as someone who dealt with him primarily on off-field endeavors, I can assure you that he was even more important to the franchise and to his home country in that regard. Not only did he donate huge amounts of money to the Dodgers Dream Foundation over the last six years, but I will always recall a conversation we had at the sushi bar in our Pittsburgh hotel at the end of the 2008 season. He never really tells anyone about all that he does back home in his hometown of Loma de Cabrera, but we got to talking about the poverty he grew up around. He made a passing comment about the local hospital and how the residents know that if they can’t afford their bills, the hospital just bills him. It was unfathomable, but in his mind it was simply what he is supposed to do. That’s also the first time he mentioned that his hometown doesn’t have a firetruck, another concept that’s hard to believe for those of us in the States. When a fire burns here, we pick up the phone, call 911 and people come and help put it out. Down there, they simply don’t have that luxury. 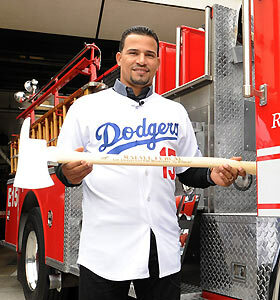 That’s when we talked about the fact that if he returned to the Dodgers as a free agent, we would make sure that his hometown gets a firetruck. Well, it took some time and effort from a lot of people, but there’s now an LAFD firetruck in customs in the Dominican, en route to his hometown and Raffy’s efforts in that regard will truly save lives. And his generosity at the local hospital saves lives. And for those who saw his “Before the Bigs” on Prime Ticket, you truly get a sense of the heartache he’s experienced in his life. I’m sure he feels like there was unfinished business here on the field, but off the field he’s made his mark and on the field, he was truly a lineup changer whenever he was healthy. And if you’ve had the pleasure of watching a five-year-old Raffy Jr. in a batting cage at Camelback Ranch, you get the sense we’ll be seeing that kid someday in the big leagues. On behalf of the entire Dodger organization and its fans, good luck, Raffy. You and your family deserve nothing but the best.